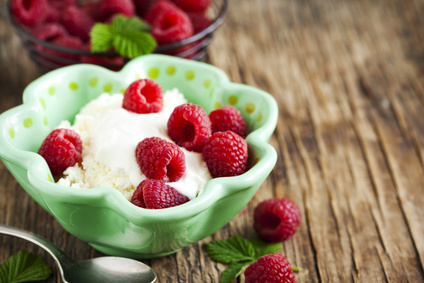 Cottage cheese is a secret weapon to increase protein and keep body fat down. For all the cottage cheese haters out there, I’ve got great news. You won’t know it’s even there! In fact, It makes recipes creamier and more delicious without you even recognizing its presence. So if you tolerate dairy, then take advantage of this protein-packed craving-stopper and muscle protector. A protein-rich breakfast reduces physical hunger through the entire morning and decrease your food cravings throughout the day. 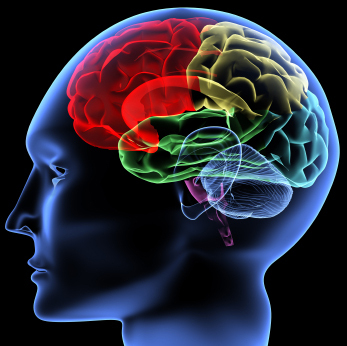 Several studies from the University of Missouri show that eating protein in the morning tones down the pleasure-seeking part of the brain associated with food cravings and cocaine addiction, while also activating the executive-decision part of the brain. The result? You end up with a lot more control over what you eat—especially late at night when your resistance to indulgence is at its lowest. Try to eat between 30 and 40 grams of health-promoting protein for breakfast. Protein foods from plants (like nuts, nut butters, seeds, quinoa, oatmeal) as well as from yogurt, kefir, seafood, cottage cheese, and even barnyard eggs are the healthiest high-protein sources. Keep in mind that drinking protein for breakfast doesn’t work as well as eating food does, in terms of your satisfaction and reducing food cravings. However, protein drinks can help build muscle just as effectively. It appears that the lack of chewing causes less gratification and doesn’t deactivate the pleasure seeking part of the brain to the same extent. While protein keeps us full and satisfied, it is also critical to building muscle, along with movement. Most of us eat enough of it to get by, but often we don’t take in enough to offset age-related muscle loss. We eat too much at one time (usually in the evening) rather than spreading our protein intake through the day to maximize our daily movement and build muscle. Around the age of thirty, we start to lose muscle mass every year. Without enough protein spread out over the day to supply the amino acids needed to build muscle, we can’t build valuable lean tissue to help fight off that muscle loss. Plus, those muscles burn calories for us twenty-four hours a day, seven days a week — even when we’re at rest. You need at least seventy-five grams of protein spread out between meals and snacks to preserve and increase muscle mass. But the body can only use a certain amount of protein at a time. If you take in over fifty grams in one sitting, the extra protein turns into energy (or fat stores), leaving you without extra muscle benefit. Protein’s muscle building blocks last only about three hours after you eat it, so it’s important to spread your protein intake out over the course of the day. Multiply your current weight in pounds by 0.5 and that will give you an estimated number of grams of protein you need per day to promote body fat loss while building muscle. (180 Ib x 0.5 = 90 grams protein per day.) If you are in training and exercising more than an hour/day on a regular basis, you may want to multiply your body pounds by 0.6 or even 0.7 to make sure you are supplying your body with enough building blocks of muscle. Providing an ample supply of amino acids and movement throughout the day helps preserve and promote muscle. The amount of muscle we have appears to be a critical factor in our overall health especially as we age.  Whey protein, found in milk, is easily absorbed and retained by the body. It’s also the richest source of leucine—an amino acid that triggers muscle building. 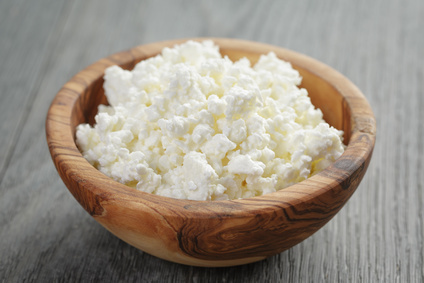 Cottage cheese has the most leucine of any dairy food and contains about 28 grams of protein per cup. With 28 grams of protein per cup, a little cottage cheese mixed into food can go a long way. Many who didn’t grow up eating cottage cheese seem to be afraid of the texture. But in fact, cottage cheese mixed into yogurt makes it creamier than ever. I love how it dilutes the added sugar in sweetened Greek yogurt to make a super quick breakfast on the go. 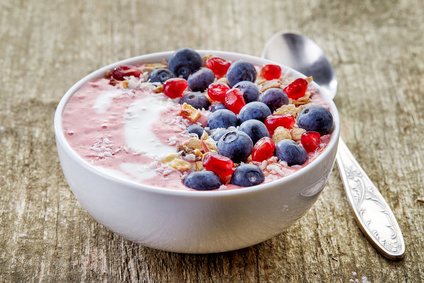 Simply mix a couple of tablespoons of cottage cheese in the yogurt cup, top with nuts and fruits and slowly eat your almost 30 protein gram breakfast in the car. When I don’t have to grab and go, I toss about a cup of plain Greek yogurt (sweetened with a little real maple syrup) in a bowl with about 1/4 cup cottage cheese and top with my protein-rich granola (or more nuts) and fruit. So satisfying, and usually includes around 35 grams of protein. Cottage cheese makes my scrambled eggs better too. 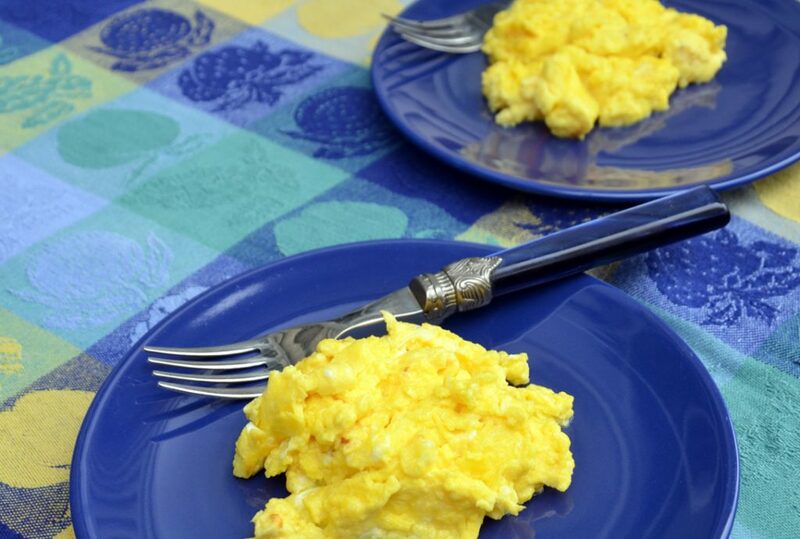 I’m often told my Protein-Packed Scrambled Eggs are great. People are surprised when I tell them it’s the cottage cheese. They didn’t even realize there was cottage cheese in them. I add cottage cheese to pancakes too. 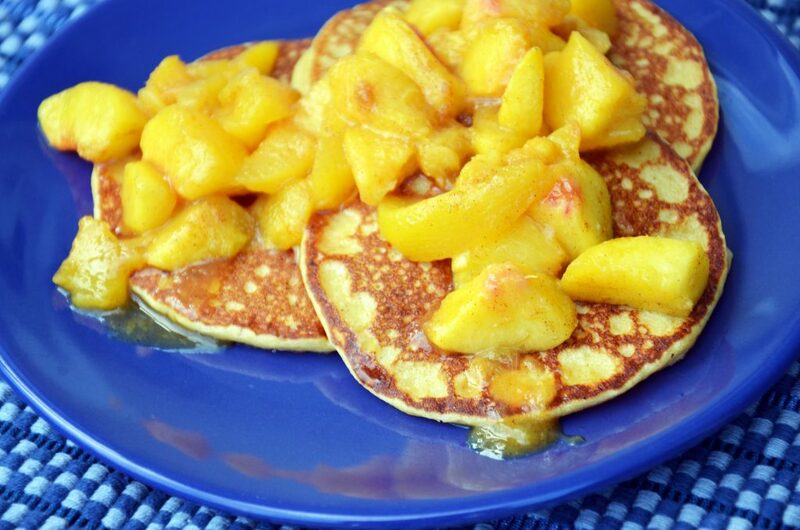 My Oatmeal Pancakes are another delicious and sneaky way to boost breakfast protein. If you already like cottage cheese, try adding fruit like peaches and raspberries topped with almonds for a delicious high-protein snack after a workout or for a light lunch. Make the cottage cheese savory by adding vegetables. 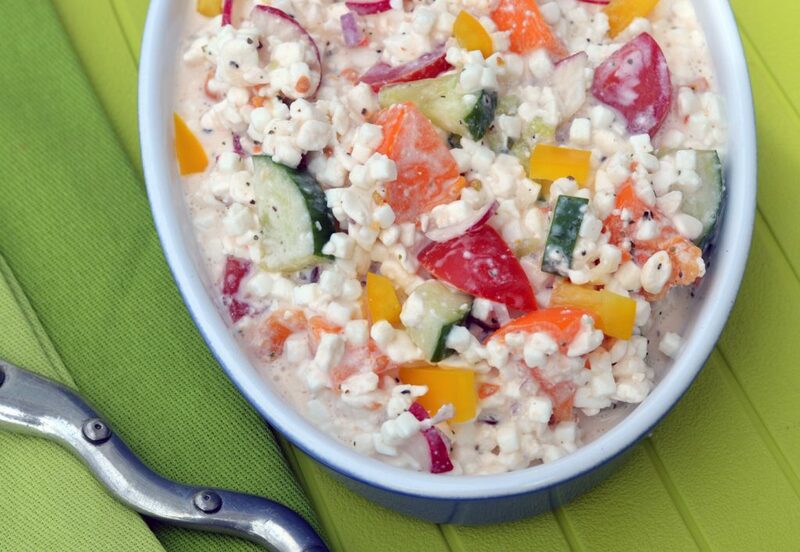 Try my Cottage Cheese Veggie Salad made with radishes, cucumbers, green onions, orange peppers, and tomatoes. Choose a cottage cheese without fillers, like Daisy Cottage Cheese. Just check the label; the fewer the ingredients, the better. So even if you don’t think you like cottage cheese, give it a try and take July’s Healthy Challenge. This high protein food can help you eat better and protect your muscles. Will you add me to your mailing list, please? Common, inexpensive cabbage is chock-full of powerful nutrients that fight disease and promote health in dramatic ways. Below, I will share the best ways to prepare cabbage to maintain its many nutrients and preserve its great flavor.